"BHAKit" the Basic Headphone Amplifier Kit is an analog educational kit about op amp applications based on New Japan Radio NJM4556AD dual high current operational amplifier capable of delivering 50mW power into 32 ohms load (enough to produce high volume levels through typical headphones). The kit is intended for breadboarding, but can be built on the supplied prototyping board. NJM4556AD is configured as a simple supply AC-coupled non-inverting amplifier with a gain of 3 demonstrating one of the most popular consumer electronics applications of op amps, the headphone amplifier. 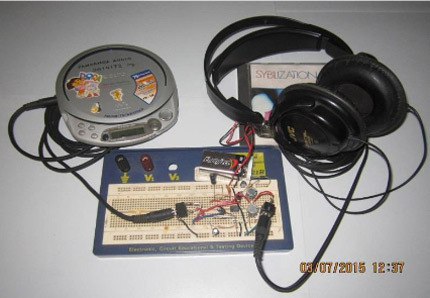 As an analog educational kit you breadboard the circuit to have the convenience to hook up an ammeter to monitor current flowing into each component or solder the components to the prototyping board then enclose in a plastic project case to have your 1st DIY headphone amp on the go! For detailed headphone amplifier design and testing there are many excellent technical materials at http://nwavguy.blogspot.sg/. To maximize analog learning, modifying the circuit with a power transistor and trimmer resistor, a basic motor speed controller can be designed, an example of DC application of the operational amplifier even though NJM4556AD is not optimized for DC amplification (Analog Devices OP07CPZ is recommended to improve offset voltage). The kit is all set with 3V hobby motor and circuit operation is discussed by Andy Collinson of Circuit Exchange International. It is suggested to check out Analog Devices Hardware and Housekeeping Techniques to avoid the pitfall of poor circuit assembly. "BHAKit" the Basic Headphone Amplifier Kit circuit schematic. Amp A is for the left channel & amp B is right. 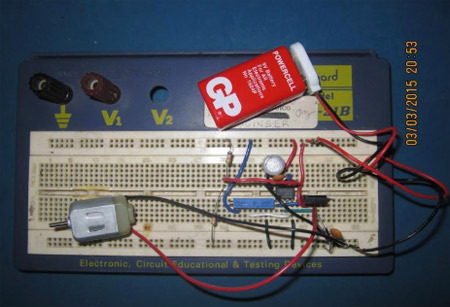 Place the components on the breadboard according to the schematic. Install 0.1uF bypass capacitor as close as possible to the IC power supply pins 4 & 8. Potentiometer R9 & R10 (Dual Audio Potentiometer) is optional intended for audio player without volume control. Solder AWG 22 solid wire to connectors J1 & J2, dual potentiometer R9 & R10, 9V battery snap & toggle switch S1 to facilitate installation on breadboard. Connect ICs & passive components via AWG 22 solid wire. It is suggested to use multi-colored wire to ease signal tracing and troubleshooting. Pay attention to grounding and layout to minimize oscillation. Separate signal (star/mecca ground) and power ground. Connect power ground closer (compared to signal ground) to power supply ground. Signal ground are audio input connector J1-C1, resistors R7 & R8, dual potentiometer R9 & R10, capacitors C7 & C8. Power ground are audio output connector J2-C1, IC pin 4, capacitors C5 & C6. If potentiometer R9 & R10 (Dual Audio Potentiometer) will not be used, connect audio input connector J1-C2 to capacitor C1 & audio input connector J1-C3 to capacitor C2. Connect a CD Audio/MP3 player headphone output to 3.5 mm Male to Male Stereo Cable (or Line out to 2 RCA Male Plugs to Stereo 3.5mm Male Plug) to the headphone amplifier 3.5mm input jack J1. Connect a headphone with 3.5mm plug to the headphone amplifier 3.5mm output jack J2. 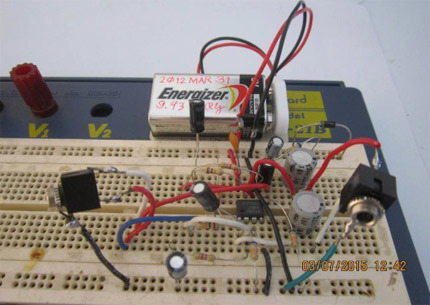 Connect a 9V battery to the 9V battery snap & turn on switch S1. 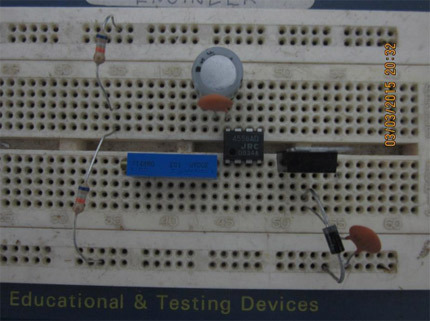 Series an ammeter by connecting its red test probe to the power supply positive terminal & black test probe to toggle switch S1-C1 to measure quiescent current (no input signal & load). The scope (Tektronix TDS 2012B) plot shows a 1 kHz 121mVrms input (CH1) & 367mVrms output (CH2) @ 32 ohm load, gain is equal to 3.03 (9.64dB). 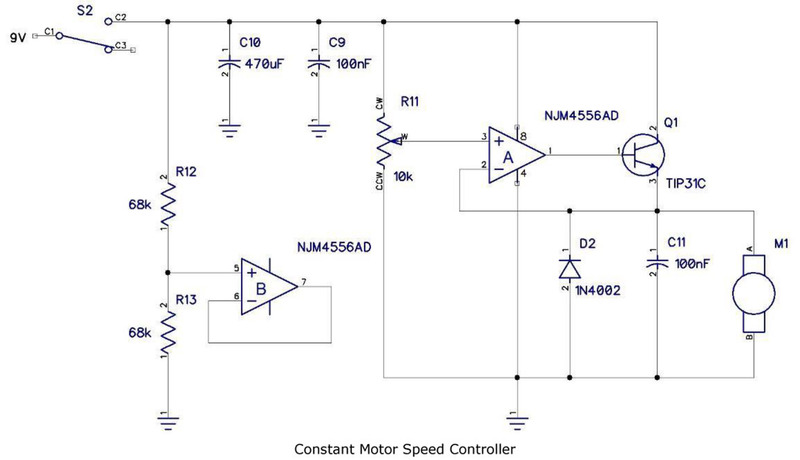 Motor Speed Controller circuit schematic. Amp B is not used, it is biased halfway the power supply equal to 4.5V for 9V power supply. Set trimmer R11 resistance between wiper & ground to 3.3kohms for 3V motor voltage with 9V power supply. If power supply is other than 9V use this formula Rx = 3V x 10kohms / Vcc where Rx is the resistance between wiper to ground & Vcc is the power supply voltage. Solder AWG 22 solid wire to 9V battery snap, motor M1 & toggle switch S2 to facilitate installation on breadboard. Connect ICs & passive components via AWG 22 solid wire. It is suggested to use multi-colored wire to ease signal tracing & troubleshooting. Pay attention to grounding & layout to minimize oscillation. Separate signal (star/mecca ground) & power ground. Connect power ground closer (compared to signal ground) to power supply ground. Signal ground are trimmer R11 & resistor R13. Power ground are capacitors C9, C10 & C11, diode D2, IC pin 4 & motor M1. Q1 base & collector current at no load. 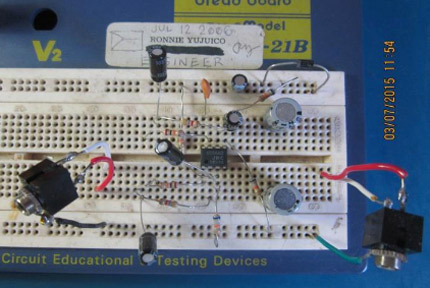 Measure base current by connecting an ammeter between op amp pin 1 & Q1 base. 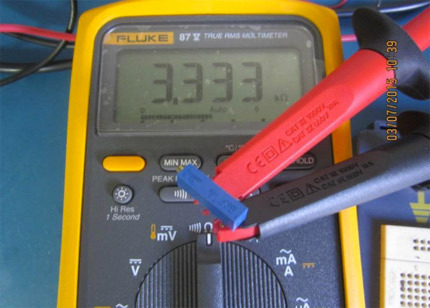 Collector current is measured with an ammeter in series with the collector. Ammeter resolution equal to or less than 100nA is recommended to measure accurately the base current. Slowly turn counterclockwise trimmer R11 while observing (peculiar) behavior of motor speed & voltage.